When the University of Miami became part of the green movement, Alan Fish led the charge, spearheading numerous efforts that today are helping to make the institution more sustainable. When swarms of local media arrived on the University of Miami campus to observe and report on the school’s testing of a new emergency message system, Fish was the first person to answer their questions, looking straight into the cameras while confidently explaining how the method worked. And whenever a storm threatened UM, Fish was always at the forefront, making the tough decisions that ensured the safety of students and employees. Fish, former vice president for business services and chair of disaster management who played key roles in myriad programs and changes at the University, died Saturday, August 22, after a long battle with cancer. He was 61. A celebration of Fish’s life will be held on Friday, August 28 at 5 p.m. in Gusman Concert Hall. UM employees are encouraged to park in the Pavia Garage and walk to Gusman. Flags on the Coral Gables campus will be flown at half-staff on that day. 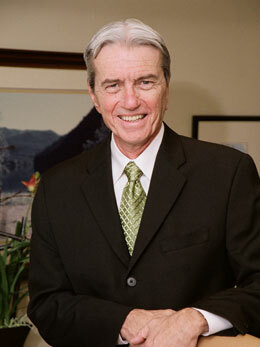 Fish came to UM in 1977 and was appointed vice president of business services in 2003, a role in which he was the driving force behind a division that handles the establishment, monitoring, and review of the majority of UM business contracts, with his signature appearing on thousands of documents. “As vice president for business services, Alan Fish was a creative, thoughtful, and irrepressible member of the University’s leadership team,” said UM President Donna E. Shalala. “He always understood he was working at a university. There was no student idea or concern he was not willing to take on; if it was important to them, it was important to him. He once convinced very skeptical, budget-conscious administrators that free washers and dryers in our residence halls were cost effective. The unit Fish led is responsible for every business service center at the University, from bookstores, food services, and public safety to risk management, procurement, materials management, environmental health and safety, and parking and transportation. Fish retired from the University last year, ending a 30-year career during which he oversaw and helped implement several improvements at the school. Two of the most recent University accomplishments in which he played a major role were the opening of a new on-campus glatt kosher restaurant and the establishment of a program—UBike—that offers affordable bicycles, bike accessories, and enhanced bike-friendly pathways on the Coral Gables campus. Fish also helped launch the institution’s Green U program, spearheading sustainable initiatives that included everything from the use of biodiesel fuel in UM’s shuttle fleet to an extensive recycling program and the purchasing of energy-efficient products. “A passion for the U” is how Fish once described his love for UM. Colleagues and friends who knew Fish will remember him as a man who believed in being prepared, a characteristic that was evident in his role as chair of disaster management. In that role, he guided UM’s emergency response team through countless hurricane threats and a number of actual storms. After Hurricane Andrew struck the Coral Gables campus in 1992, causing millions of dollars in damage, he helped create the University’s disaster preparation and recovery plan, reviewing and improving it annually. Fish also played a key role in the design of the school’s emergency operations center and spearheaded efforts to improve University-wide communication and response to potential threats with the implementation of a new Emergency Notification Network. Fish, a graduate of Rochester Institute of Technology, earned his M.B.A. from UM’s School of Business Administration. He also completed Harvard University’s prestigious Management Development Program. At UM’s fall commencement exercises, Fish received the University of Miami President’s Medal. Fish was also tapped into Iron Arrow, the highest honor attainable at the University. Fish was married to Marcy Ullom, UM’s associate vice president of Continuing Education.